Is it possible for a family to be truly self-sufficient and provide all of its own food? This is a question that the Office for Social Ministry is grappling with as it reflects on how to transition its food ministries, many of which run food pantries, from an emergency mindset to a more sustainable, and nutritious one. As the work has proceeded, this has quickly become clear that this also a community-based approach, which can be best encapsulated by the concept of food justice—access and ability to take advantage of healthy and nutritious food. Yet as the work has progressed, it has become clear that a variety of strategies are needed to support the 66 parishes across the state where they are at and to assist them in exploring what food justice means to them. A huge component of this is making sure to “mahalo,” or show gratitude to many of the long committed volunteers while strategizing on how to engage new cohorts of volunteers. Stepping back, what is the role of a faith-based institution in the food production value chain? The social ministry has begun to take on a kind of “grow, share, and prepare” mission in terms of both social justice and charitable works that transcends any one belief system. • Grow—enhance your knowledge of the root causes of food security and health issues. • Share—donate your time, knowledge, and energy to improve the structures that are at the root of food-related issues. • Prepare—support the next generation to continue the fight for food justice. • Grow—start producing food or help production efforts already in place. • Share—give aid to those in need, through financial or in-kind donations. • Prepare—serve healthy food to others or educate them about how to prepare nutritious meals. • Learning & Collaborative Spaces—gathering places to share, learn, and take action to collaborate with others involved with the local food system to collectively fight for justice. • Curriculum Development—creation of standardized but flexible materials that can serve as guides to engage various groups both within and outside of parishes. • Nutritious Food Distribution—increasing access to and distribution of nutritious food for families and individuals to contribute to their improved health and wellness. • Education Through Distribution—coupling emergency food delivery with tools and information necessary to improve their personal, family, and professional lives. The Office for Social Ministry has become a catalyst for individual parishes by supporting their exploration of ‘Ohana Food Production—a foundational piece to pursue food justice and the articulation of the strategy to achieve an ‘Ohana Economy. ‘Ohana Food Production captures how any community organization, including faith-based institutions, can support individual ‘ohana, empower the next generation through experiential and relationship sustaining opportunities, and weave together other community-based efforts as well as broader institutions. 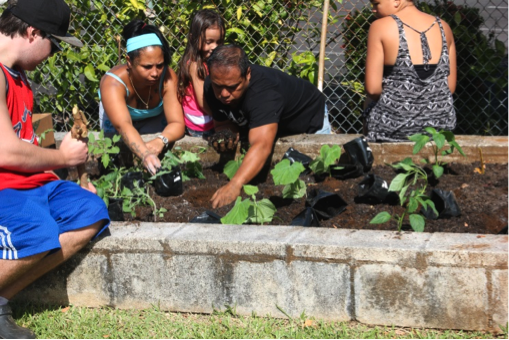 In this case, the Office for Social Ministry can lift up its mission of social justice through the lens of food justice—where food is simply an entry point to broader support as well as helping families to achieve ho‘owaiwai, or genuine wealth.